The AT8031 is one of two excellent unidirectional (cardioid) condenser mics from Audio-Technica (the other is the AT8033 below). This one is the slightly larger of of the two and a great favourite here at Solid State. It is ideal for voice-over and provides added warmth when used close up. Great for narration, its sound is similar to far more expensive studio microphones. Its cardioid polar pattern reduces pickup of sounds from the sides and rear, improving isolation of the desired sound source. 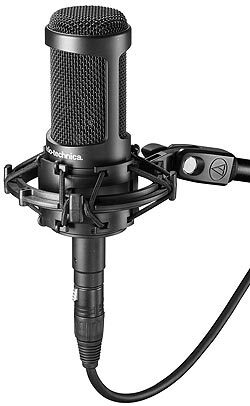 The AT8033 is one of two excellent unidirectional (cardioid) condenser mics from Audio-Technica. This one is the slightly smaller of of the two. It is a good all-rounder for both instrument and voice work. 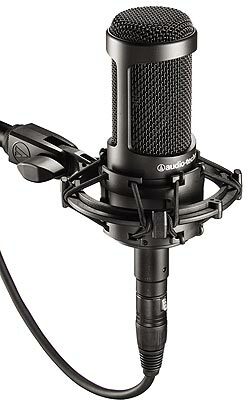 Like the AT8031 above it also good for spoken word and narration use, its sound being similar to far more expensive studio microphones. Its cardioid polar pattern reduces pickup of sounds from the sides and rear, improving isolation of the desired sound source. Supplied Accessories: AT8405a Stand Clamp; AT8136 foam windscreen; battery; soft protective pouch. The AT2050 and AT2035 below are both studio-style condenser mics for voice work as well as instrument recording. Having large diaphragms they deliver a more natural, smooth and transparent sound quality than hand-held or stick microphones. This one, the AT2050, has three choices of switchable polar patterns: cardioid, omnidirectional and figure-of-eight. Cardioid would generally be used to record one source, say, a voice-over; omni enables sources from all sides of the mic to be recorded - perfect for recording several voices in, say, a drama production; and the figure-of-eight pattern is perfect for two artistes recording face-to-face. 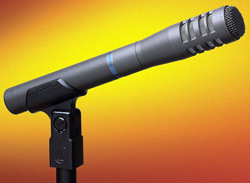 This mic is equipped with a switchable 80 Hz high-pass filter to reduce low frequency rumble and 10 dB pad to enable it to be used with high levels. We offer the AT2050 principally for voice applications but its is also ideal for piano, strings, drum overheads, guitar amps, and similar instruments. Like the AT2050 above, the AT2035 is a studio-style, smooth sounding large diaphragm condenser mic for voice work as well as instrument recording. However, this one has a fixed cardioid polar pattern. This is the most commonly used polar pattern, so if you don't really need omnidirectional and figure-of-eight options this is the one for you. Again, we offer the AT2050 principally for voice applications but its is also ideal for piano, strings, drum overheads, guitar amps, and similar instruments.